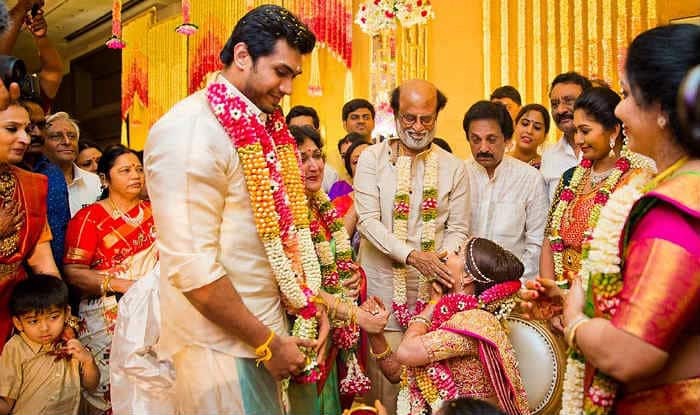 Superstar Rajinikanth has showed a lovely gesture for all those who came to bless his daughter Soundarya Rajinikanth at her wedding with businessman-actor Vishagan Vanangamudi. The actor has released a beautiful note for the guests thanking them for showering love on the couple. Rajinikanth has especially mentioned the names of Tamil Nadu Chief Minister, the Ambani family, and ministers of the state among others in his message. Soundarya and Vishagan got married on February 11 in Chennai in a lavish wedding ceremony. The director-producer wore a stunning Sabyasachi outfit for her wedding reception that was hosted by the families in the evening on Feb 11 at The Leela Palace. The pictures and videos from the wedding and other functions have been circulating on the internet. In a few, Rajinikanth’s happiness is visible as he is seen playing with the kids of his daughters and even dancing with the guests. In fact, in a few pictures posted by the bride herself, the superstar father is seen hugging Soundarya and blessing her as she starts a new life. Soundarya’s wedding reception was attended by Kajol, Aditi Rao Hydari, and Kamal Hassan among other celebrities. For the uninitiated, this is the second marriage for both Soundarya and Vishagan. The filmmaker was earlier married to businessman Ashwin. After their wedding in 2010, the duo got separated. Soundarya announced in the year 2016 that she and Ashwin had filed for divorce after four years of their marriage by mutual consent due to irreconcilable differences. It was in July 2017 that the couple finally got divorced.